The presence of the vermiform appendix in the presence of inflammation or not, in the sac of an inguinal hernia, is called an Amyand hernia. Its incidence in elective or urgent surgery is very low. 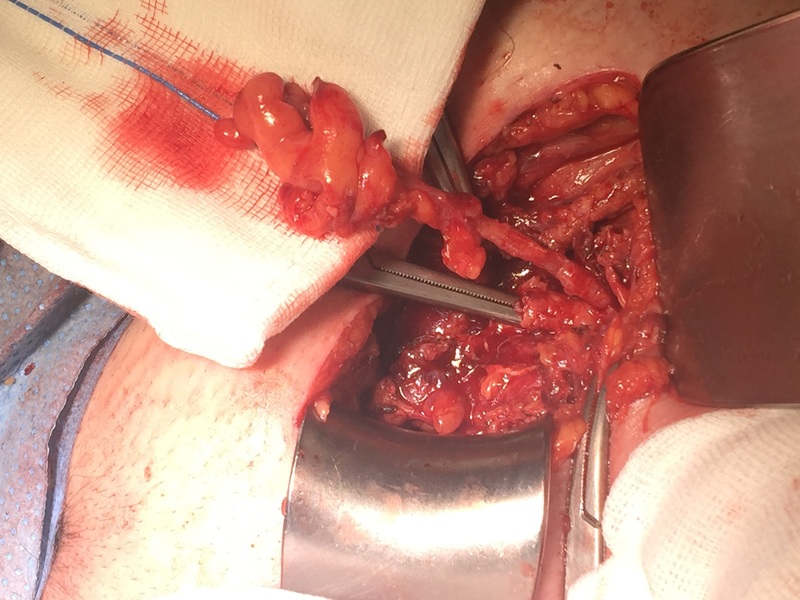 We report two patients who presented an Amyand hernia, one as a incidental finding during elective inguinal hernia surgery and the other as a result of an incarcerated inguinal hernia. More than 20 million patients are operated on hernia worldwide every year . By definition, a hernia is a protrusion of any tissue or organ outside the abdominal cavity, wrapped in a peritoneal membrane (called hernia sac) through an orifice (herniated ring). Among the contents of the hernia sac we can find preperitoneal fat, omentum, small intestine, colon or bladder. Claudius Amyand, English Sergeant and Principal Surgeon at St George's Hospital in London was the first person to perform a successful appendectomy in 1735 when an 11-year-old boy presented with an inguinal hernia whose hernial sac contained the perforated appendix . Prior to Claudius Amyand, the surgeon René-Jacques Croissant de Garengeot described the presence of the non-inflamed vermiform appendix in the hernial sac of a femoral hernia in 1731 . We report two patients who underwent an inguinal hernia in which we founded the vermiform appendix inside the hernia sac. A 49-year-old male with no medical history of interest was operated for a right inguinal hernia on a elective surgery by general anaesthesia. An incision of Gregoire was made and after a careful dissection, an indirect inguinal hernia was evidenced (Type 3 according to Gilbert's classification). The opening of the sac was made observing that inside it was a tubular structure dependent on the cecum compatible with the non-inflamed vermiform appendix (Figure 1). When there was no evidence of infection or inflammation, the hernial sac and the appendix were reduced to the abdominal cavity and the hernioplasty was completed by placing a polypropylene mesh according to the lichtenstein technique. It was not necessary to perform an appendectomy. The patient was discharged 6 hours after the intervention. There were not describe any complications in the postoperative period, without signs of hernia recurrence during the subsequent follow-up in consultations. A 76-year-old man with a history of hypertension and diabetes mellitus who presented to the emergency department with inguinal pain associated with nausea and vomiting of 12 hours of evolution. The laboratory analysis showed no relevant alterations. On physical examination, the patient presented a painful right inguinal mass compatible with an incarcerated and irreducible inguinal hernia. It was decided to perform an urgent surgery. Under general anesthesia an inguinal incision was made and after the dissection and opening of the hernia sac, the appendix was observed with signs of inflammation and vascular congestion, findings compatible with acute appendicitis (Figure 2). An appendectomy was performed and the abdominal cavity was cleaned. After the closure of the hernia sac, the hernia was repaired using a hernioplasty according to the Lichtenstein technique, using a polyglactin 910 mesh (Vycril) as a prosthesis. The patient presented a favorable postoperative period without presenting an episode of surgical wound infection or hernia recurrence during follow-up. Amyand hernia represents approximately 1% of all inguinal hernias and between 0.08 and 0.13% of the total cases of acute appendicitis [4,5]. Its preoperative diagnosis is difficult and is usually an incidental finding in most cases. It is more common in men than in women without a predilection for age . Its pathophysiology is unknown. It is supposed that it can be caused by the presence of appendicoliths or appendicular polyps when occupying the appendicular lumen . However, most authors attribute its origin to muscle contractions which cause incarceration of the appendix in the inguinal canal. The scarce blood supply produced by incarceration would produce the inflammatory changes in the worm-shaped appendix [4,5]. Patients may describe symptoms common to an incarcerated hernia and acute appendicitis such as abdominal pain, nausea, vomiting and even fever. However, the exploration is always objectified (as in the rest of complicated hernias) a painful mass not reducible at the inguinal level. Between the differential diagnosis is testicular torsion, hydrocele, lymphopathies or an inguinal abscess . The performance of imaging tests such as abdominal ultrasound or CT scan helps with preoperative diagnosis, although an incarcerated inguinal hernia is a surgical indication and the examination is performed in the operating room in most patients. The preoperative diagnosis of an Amyand hernia is difficult, so the non-operative treatment by analgesics and anbiotherapy is reduced to a small group of selected patients, those whose basic pathology, surgery, provides a great morbidity and mortality. The presence of the cecal appendix in an inguinal hernia requires the assessment by the surgeon to consider the technique to be used. For this, authors such as Losanoff and Basson have proposed a classification based on the degree of inflammation to determine both appendectomy and repair of the abdominal wall (Table 1) . Fundamentally, the presence of appendicitis is a clear contraindication for the repair of the abdominal wall through a polypropylene mesh, since when contaminated, it will generate a chronic infection difficult to treat increasing the rate of hernia recurrence . In the second patient we preferred to repair the abdominal wall avoiding a polypropylene mesh because we think vycril tolerate the infection much better. We thought that a meshless repair (Bassini or Shouldice) would have been responsible for a more painful postoperative period and with the possibility of early hernia recurrence. For some authors, the incarceration of the vermiform appendix implies vascular changes that favor phenomena of dysbacteriosis and facilitate the colonization of the prosthetic material, for which reason they recommend avoiding the use of meshes. However, authors such as Shaban have described the use of polypropylene meshes to repair the abdominal wall in the presence of appendicitis (flemonous grade) or after appendectomies without infection data . As in the patient in case number 1, the presence of the non-inflamed appendix does not necessarily indicate prophylactic appendectomy. Although the incidence of acute appendicitis in patients with Amyand hernia may seem higher than in the general population, authors such as Cigsar have not described cases of appendicitis in patients undergoing hernia repair without appendectomy due to Amyand hernia. Most authors agree that prophylactic appendectomy should be avoided in the absence of gangrene, perforation or suppuration of the appendix . In the case of children, for example, the appendix may be useful in neurogenic disorders of the digestive or urinary system, as in the Malone or Mitrofanoff procedures . On the other hand, other authors defend that the reduction towards the abominal cavity of a not-inflamed appendix will generate adhesions increasing the chances of acute appendicitis in the future . In the presence of infection, most authors agree to avoid the use of polypropylene meshes and perform hernioplasty techniques such as the Bassini or Shouldice procedure based on the reconstruction of the abdominal wall using suture material . Finally, the laparoscopic approach using TAPP (Trans-Abdominal-Pre-Peritoneal) hernioplasty is an option to be taken into account in comparison with conventional surgery, so it has a minimally invasive access to the abdominal cavity, reducing the risk of postoperative infection. The finding of Amyand´s hernia during the performance of a TAPP hernioplasty does not require reconversion to open surgery since the appendix can be removed by this way, controlling the contamination of the prosthetic material. 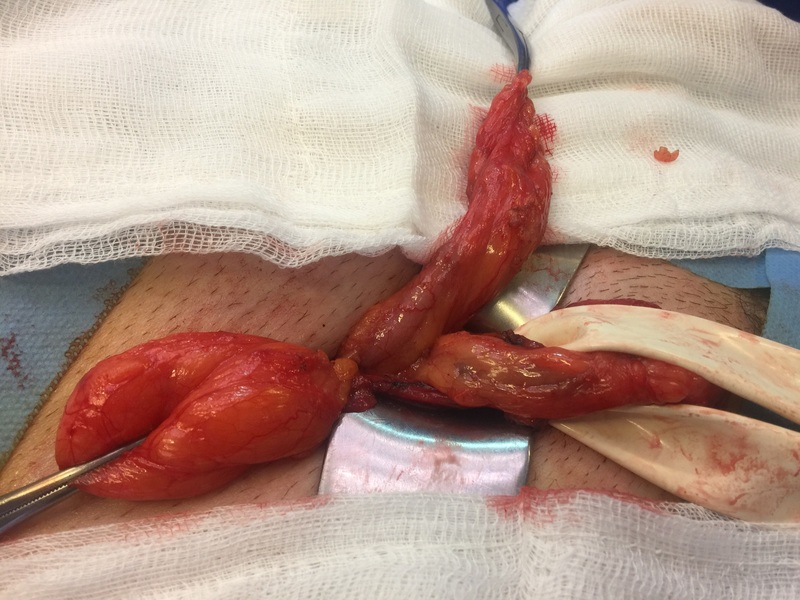 However, in TEP (Totally Extra Peritoneal) hernioplasty, the excision of the appendix is more difficult and may require changing the approach. The presence of the vermiform appendix, inflamed or not, in the sac of an inguinal hernia is a rare entity. Its preoperative diagnosis is difficult and is usually an incidental intraoperative finding. Its treatment is fundamentally surgical. The type of technique as well as the placement of a mesh in the inguinal region depends on the state of the appendix at the time of surgery. Kromka W, Rau AS, Fox CJ (2018) Amyand's hernia with acute gangrenous appendicitis and cecal perforation: A case report and review of the literature. Int J Surg Case Rep 44: 8-10. Smith-Singares E, Boachie JA, Iglesias IM (2016) A rare case of appendicitis incarcerated in an inguinal hernia. J Surg Case Rep 2016: 096. Morales-Cárdenas A, Ploneda-Valencia CF, Sainz-Escárrega VH, Hernández-Campos AC, Navarro-Muñiz E, et al. (2015) Amyand hernia: Case report and review of the literature. Ann Med Surg (Lond) 4: 113-115. Guler I, Alkan E, Nayman A, Tolu I (2016) Amyand's Hernia: Ultrasonography findings. J Emerg Med 50: 15-17. Velimezis G, Vassos N, Kapo'giannatos G, Koronakis D, Perrakis E, et al. (2017) Incarcerated recurrent inguinal hernia containing an acute appendicitis (Amyand hernia): An extremely rare surgical situation. Arch Med Sci 13: 702-704. Ciftci F, Abdulrahman I (2015) Incarcerated amyand hernia. World J Gastrointest Surg 7: 47-51. Losanoff JE, Basson MD (2008) Amyand hernia: A classification to improve management. Hernia 12: 325-326. Bougard H, Coolen D, de Beer R, Folscher D, Kloppers JC, et al. (2016) HIG (SA) Guidelines for the management of ventral hernias. SAJS 54. Shaban Y, Elkbuli A, McKenney M, Boneva D (2018) Amyand's hernia: A case report and review of the literature. Int J Surg Case Rep 47: 92-96. Cigsar EB, Karadag CA, Dokucu AI (2016) Amyand's hernia: 11years of experience. J Pediatr Surg 51: 1327-1329. Benavides de la Rosa DF, López de Cenarruzabeitia Í, Moreno Racionero F3, Merino Peñacoba LM, Beltrán de Heredia J (2015) Case report: Amyand's hernia, diagnosis to consider in a routine procedure. Rev Esp Enferm Dig 107: 708-709. Figure 1: Amyand´s hernia in elective surgery. Figure 2: Vermiform appendix in incarcerated inguinal hernia. Table 1: Losanoff and Basson classification of Amyand hernia. Citation: Mendoza-Moreno F, Díez-Gago MR, Mínguez-García J, Zarzosa-Hernández G, Tallón-Iglesias B, et al. (2018) What do we know about Amyand Hernia? Report of Two Cases. Trends Anat Physiol 1: 005. Copyright: © 2018 Mendoza-Moreno F, et al. This is an open-access article distributed under the terms of the Creative Commons Attribution License, which permits unrestricted use, distribution, and reproduction in any medium, provided the original author and source are credited.